CHAPEL HILL -- His friends remembered him as courageous, cranky and caring, a world traveler who always returned to his favorite spot on Franklin Street, a postcard-sender, a movie-lover, a book-giver and a patriot. 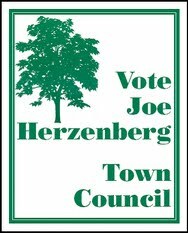 Joe Herzenberg, who died from problems related to diabetes at the age of 66 on Oct. 28, was remembered during a memorial service Thursday at the Chapel Hill Kehillah. About 175 people, including state senators, mayors, councilmen, aldermen, activists and old and new friends attended the morning service. 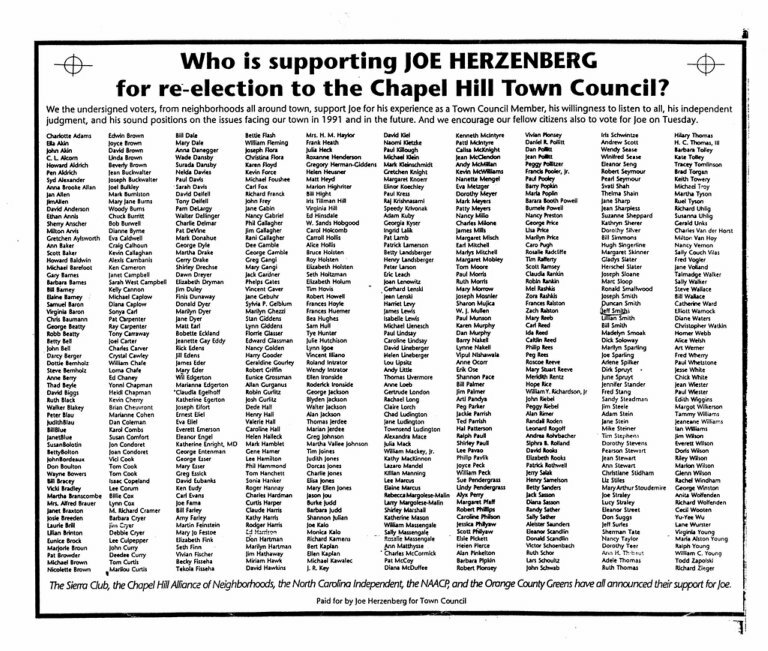 Although publicly Mr. Herzenberg was known as the first openly gay elected official in North Carolina -- winning his race for Chapel Hill Town Council in 1987 -- and was admired for leading the way and opening doors for other young politicians, both gay and straight, to many he was also a dear friend. State Sen. Ellie Kinnaird, who worked with him on many Democratic party events and issues, told of going to the movies with him for years and years, and then having dinner together afterward at Margaret's Cantina. "If I was reading a newspaper article late at night, I could call him at midnight to talk about it and know Joe would be up," Kinnaird said. Mr. Herzenberg, who sometimes sat in front of Pepper's Pizza with his trademark floppy hat and was known as the mayor of Franklin Street, had traveled throughout the nation and the world, including trips to Antarctica and Africa during the last years of his life. His best friend, Kathie Young, remembered sleeping in a tent in Africa as the rain poured down. Mr. Herzenberg wrote in his journal how nice it was to sleep with the sound of the rain on the tent, "and how he got a good night's sleep because he couldn't hear Kathie snoring," she said with a laugh. On his trips he studied the history, the culture and the country, said his friend Jonathan Courtland. "What he learned really helped inform his idea on how he could better help his community," Courtland said. He met his goal of visiting all 50 states, and when he traveled he sent his friends postcards with little notes on them. "I'd love to see if we would all stack our postcards up how big the stack would be," Courtland said. 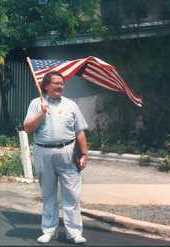 Mr. Herzenberg, described as a voracious reader, also was known for giving books away. 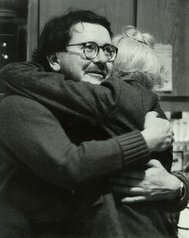 Sometimes a friend would open the front door in the morning to find Mr. Herzenberg had left a book on the doorstep, or a friend's child would receive a book as a gift when Mr. Herzenberg stopped by for a visit. Mr. Herzenberg, described as a patriot who loved the Constitution and the Bill of Rights, loved gathering with his friends, listening to Mozart and operas and talking about politics. Leonard Rogoff, the founder of the Chapel Hill Kahillah, summarized Mr. Herzenberg's Jewish philosophy. "They tried to kill us. We won. Let's eat." 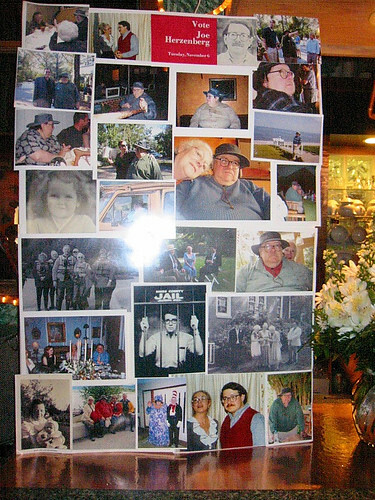 Memorial collage at Margaret's Cantina after Joe's service. Photo by Ruby Sinreich.